As international attention focuses on military escalation, geopolitical factors and the spread of Daesh (also known as the Islamic State, or IS), Syrians are increasingly absent from the debates, with no way to frame the events in which they are the main protagonists. The cultural production of Kafranbel stands out for its effort to counter this trend, presenting powerful storytelling from a Syrian collective point of view, but stories framed as universal. A distinctive feature of Kafranbel's storytelling is the reference to international current events. Far from isolating itself from the rest of the world, the town uses every international celebration, catastrophe or event to make a connection with the Syrian struggle. Examples of this technique range from the Boston marathon bombings and the shooting of African-American high-school student Trayvon Martin to internationally recognized dates such as Mother's Day or Children's Day, which are used to address a global audience by framing Syrian suffering and struggles in identifiable and relatable terms. One of the most powerful banners depicts the death of children in Syria with a message that reads "Only in Syria children are killed during International Children's Day" - a stark enough contrast between the international community's declaration of support for children's rights and the constant violation of these rights in Syria. 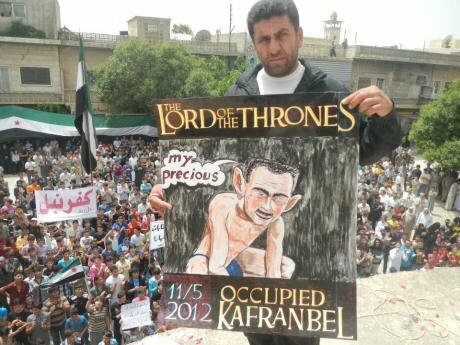 Kafranbel uses the global visibility of internationally-recognized events to increase its outreach and expose the 'international community's' double standards. By echoing worldwide celebrations, events and symbols, it highlights the contradiction between international discourse and the reality of Syrian suffering. 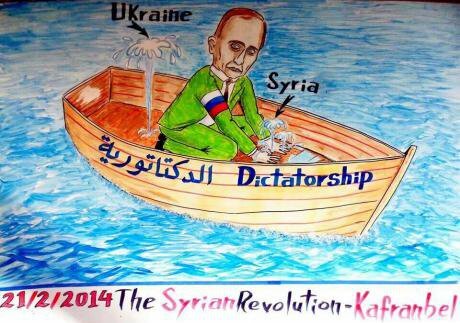 One of the most effective depictions of this contradiction is a banner representing Russian president Vladimir Putin holding Bashar Al Assad on his lap, crowned with the symbol of chemical weapons, as he receives the Nobel Peace Prize. The town dedicated several of its banners to criticizing the Nobel Peace Prize nominations, in powerful images that combine symbolism and criticism in a graphic, accessible manner. In banners soaked in dark humor, which has become a trademark of Syrian narrative and storytelling, the Syrian president takes the shape of iconic villains that range from Child's Play Chucky, or The Smurfs' Gargamel. Other characters are Popeye, Tom and Jerry, the Roadrunner and SpongeBob, well-known characters effectively used to reach all audiences. In addition to current events and international references, connections are established between Syria's legitimate resistance against tyranny and other universally-recognized struggles. 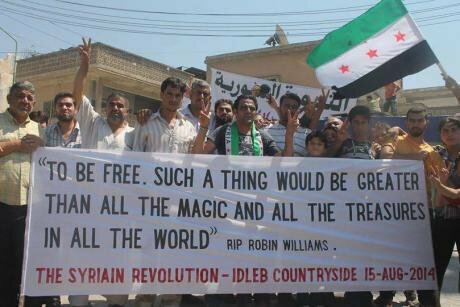 Kafranbel's banners mention uprisings, revolts and demands by other peoples, such as the Egyptian, Burmese or Ukranian people, to whom the town offers its solidarity. There are also reflections on past struggles. When the world was commemorating the figure of Nelson Mandela, Kafranbel joined in the celebrations, thanking the South African leader's legacy and connecting it to the Syrian nonviolent movement, forsaken by the international community. Mandela's figure is revered, while democracy is characterized as a terminally-ill patient, connected to a blood transfusion device. Through these references, the Syrian tragedy transcends the local factor and becomes a global loss, a retreat from universal rights and freedoms that not only affects Syrians but threatens citizens all over the world. What is at stake, Kafranbel's banners tell us, is the threshold of impunity and the lack of accountability, as Syria has proven there are no mechanisms, will or ability to protect civilians from the ruthlessness of rulers. 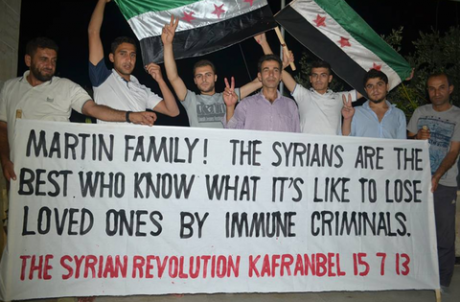 It is to this global awareness that Kafranbel appeals. In the face of geopolitical discourses that focus on proxy wars and military aspects, Kafranbel combines the reflection on geopolitics with the narration of internal dynamics and demands. These demands, although local, transcend the town of Kafranbel, the country and the region, to appeal to any citizen anywhere, through shared references and values.